The Hypocrite's Oath: Has modern medicine compromised the Hippocratic Oath? Doctors begin their careers with The Hippocratic Oath, swearing to uphold moral and ethical standards for the wellbeing of the patient. But the attitude among many doctors has evolved into a modern day version along the lines of "I'll do what I can for the patient, unless it puts myself in jeopardy." There is an ideological shift happening in medicine, and it is keeping doctors from providing the most complete care possible. Doctors are becoming victims of a litigious society that is changing the way they communicate about patient care. Even though there has been a rise of advanced, secure communication platforms in health care technology, there is an emerging phobia of all information becoming discoverable. Doctors are having to censor their communication lest it resurface in a malpractice lawsuit. I was recently working with a doctor during a mobile charge capture training for pMD, and he echoed an all too familiar mantra in the industry. He generally doesn’t record anything that he wouldn’t want the world to see. At some point in his career, he had taken a strong stance of never recording any information in his EHR around patient care that could potentially be used against him, even if sharing that information meant helping the patient. Yet the alternative, sending sensitive information in non-secure texts or writing it on pieces of paper or not sharing it at all, is far worse. This reaction points to the hesitation that exists in the health care community to record any kind of informal, candid information about patient care, stemming from a larger “Big Brother” paranoia. So what are doctors not saying that could be jeopardizing patients (and breaking the Hippocratic Oath)? Advanced communication platforms for sharing health care information are being developed to improve care coordination among providers, allowing them to stay involved in up-to-date patient information more fluidly. The unintended consequence is that providers are becoming more cautious about sharing certain medical information and fostering trust issues with the system at large. Communication is imperative in medicine, and it’s an uphill battle against many different forces to improve and increase the communication in the patient + doctor + administrator intersection. Doctors pledge that they will apply all measures necessary to care for their patients and gladly share knowledge with each other. It's time that "Big Brother" backs off so doctors can start using technology as it’s intended - as a resource used to save patients rather than avoiding it to save themselves. The biggest news out of Apple this week wasn't related to devices, but it did reinforce the company's long list of trailblazing. Tim Cook is the first CEO of a Fortune 1000 company to publicly say that he is gay. We're not sure if this is causation or correlation, but Apple devices among pMD's charge capture providers increased this week. Apple has topped Android in net mobile devices for the week, adding 0.07 percent to its dominance among pMD's mobile charge capture providers. Many of pMD's health care providers use pMD on their iPhone and iPad, taking advantage of the larger screen real estate the iPad has to offer. Apple is still the top tablet manufacturer in the US and earlier this month they released the iPad Air 2 to glowing critic reviews. The iPad Air 2 is significantly thinner, lighter, and overall more powerful, making it a popular Apple mobile device for doctors to use for work. For the second week in a row Apple took away more of the mobile device pie from Android among pMD's charge capture providers. Apple took a big dip in the month of Sept. but gained it all back by Oct.; see graph below. This comes at a time when Samsung warned that its third-quarter earnings would fall below market expectations. (courtesy of Daring Fireball). Samsung's answer? New mid-range and low-end devices, which would make Samsung's products more competitive in markets like China. In the meantime, Apple seems positioned to continue its control in mobile health and charge capture in America. Considered by locals as the best kept secret around, the Florida panhandle and Alabama Gulf coast beaches are the best in the country. Oops, I guess that secret is out of the bag now… The Alabama Medical Group Management Association (AL MGMA) summer conference attendees get to witness that beauty first hand. Every year, the AL MGMA hosts a summer conference in Sandestin, Fla. The AL MGMA exists as a forum to allow health care professionals to exchange information and ideas and better network to lead their respective practices and organizations. The AL MGMA did a great job hosting the conference, which was primarily attended by administrators, consultants, and vendors. Over the last ten years, focusing on helping practices improve efficiencies through charge capture has allowed me the privilege to meet a lot of great people. At the conference, I put faces to names that I've worked with for years but have never met in person, and I saw other faces that I hadn't seen in over a decade. I enjoy helping others solve problems, and it was great to witness the community of attendees working together to exchange thoughts and best in class solutions and ideas. As health care continues to change at a rapid pace, it's important to learn from your peers' experiences so that you can help lead your organization to be the best it can be. This conference reminded me of the importance of supporting organizations like the local MGMA so practices can continue operating at a high level of proficiency and focus on delivering better care to patients. I made a couple of new friends, Dwayne and Michelle, from the AAPC that were exhibiting next to me. The AL MGMA hosted a tailgating “lawn party” one evening as a social gathering. You weren’t allowed into the party without these fantastic glow necklaces! Negative Reinforcement for Fitness…and Charge Capture? Well, here it is: the app you never really wanted. A fitness wristband called the Pavlok is due out next year. For $149.99 (pre-ordered) you can receive an electric shock if you miss a workout or hit the snooze button. No word on whether this will turn couch potatoes into fitness buffs or simply crispy fries, but it does make me wonder about negative reinforcement and its positive effects. The creator of the the Pavlok, Maneesh Sethi, came up with the idea after he hired a woman to slap him each time he checked Facebook during the day. He claims that his productivity quadrupled. After using the Pavlok prototype for a year, he claims to have lost weight. Shocks and slaps may not be part of an ideal charge capture solution, but these ideas came about because negative reinforcement can be an effective way to change behavior. In a charge capture product, what could negative reinforcement look like? We’ve heard from a group that fines health care providers if charges aren’t submitted to the billing office within 24 hours of the patient visit. The threat of fines motivates providers to submit visit information in a timely manner, and the group is seeing very little lag between the time of visit and time of charge entry. It’s working! Negative reinforcement to motivate health care professionals to improve an existing charge capture process or secure messaging solution could take many forms. An alarm that rings at a set time everyday until daily charges have been entered? An email blast to administrators about the number of visits entered? Electric shocks would be reserved for texting PHI unsecurely (just kidding!). Thank goodness we’re in the business of making doctors happy. The alternative is shocking. I must be getting to the gym now. 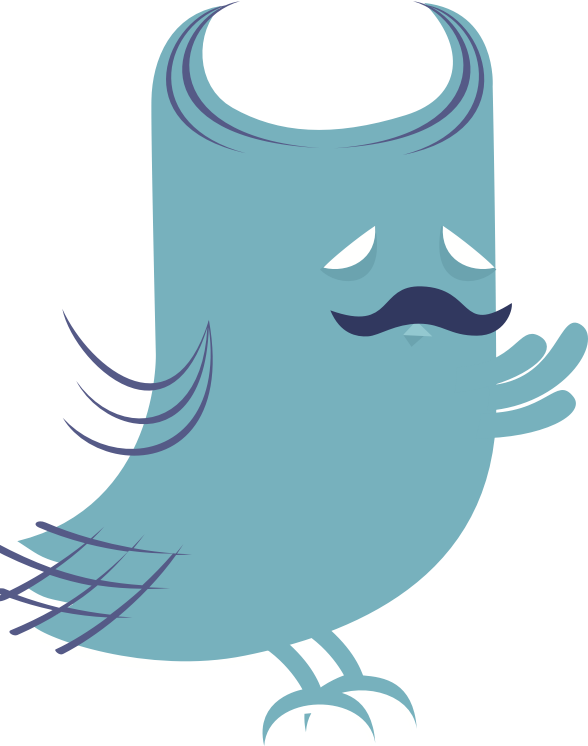 At pMD, we have always loved our characters and illustrations - our most notable being Dr. Mustachio. Before we had our How It Works video, we had a simple page with images and descriptions explaining the pMD charge capture process. To many newcomers of our website, especially individuals looking to us as a potential employer, the term “charge capture” was a foreign one. Our descriptive images illustrated charge capture in a simple and cohesive way, allowing for an easy understanding. 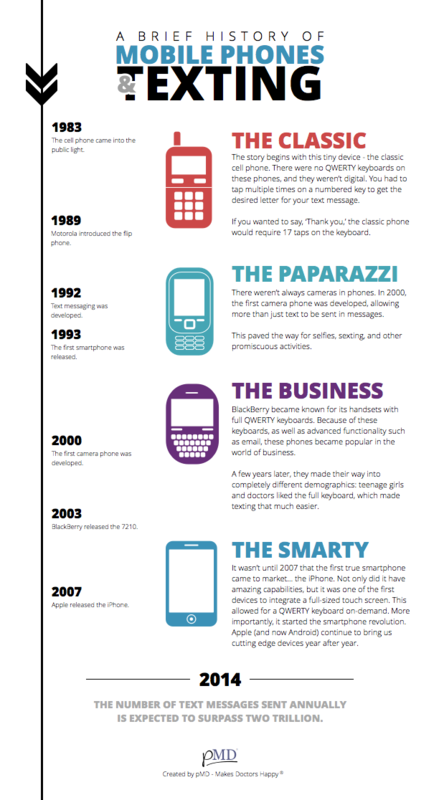 I recently came across these images and put them together as a Slideshare. To this day, they still offer a great explanation of charge capture and pMD. Enjoy! Today is a special day, a marvelous day, a miraculous day… Well, it is if you enjoy numbers, charts, and everything about Apple. July 22 marks the end of Apple's third quarter, meaning that it's time for their much anticipated Q3 Earnings Report. As a mobile charge capture company, we have to stay informed on the latest smartphone developments and their manufacturers. Our very own Señor Goat has been reporting on pMD’s mobile market share every Friday, and it’s our quarterly opportunity to see how our biggest slice of the pie is doing. 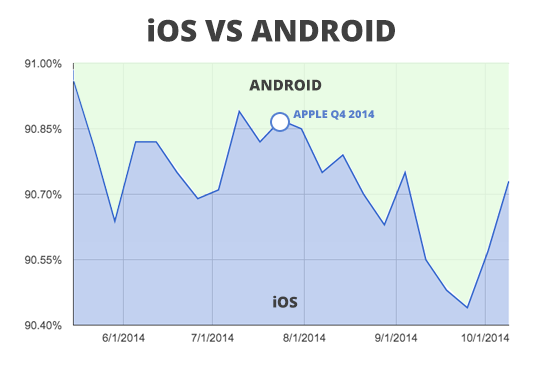 Let's take a look at pMD's mobile device breakdown between Apple’s last earnings call in April and today. Perhaps we may have a correlation between Apple’s numbers and pMD’s. Although, before we get to the numbers, which I know you're super anxious to find out, let’s consider some rumors that have been flying around Apple lately. First off, it’s expected that the iPhone 6 will take the stage in September of this year, with a larger screen, new form factor, and a variety of new functionality. Also expected is the iWatch, possibly announced within the coming months. Currently, the iWatch is a rather mysterious and elusive device, but it could prove to be a game changer in the mobile sphere. Looking at the charts, Android took away 0.3 percent from iOS market share among doctors and other health care providers using pMD. 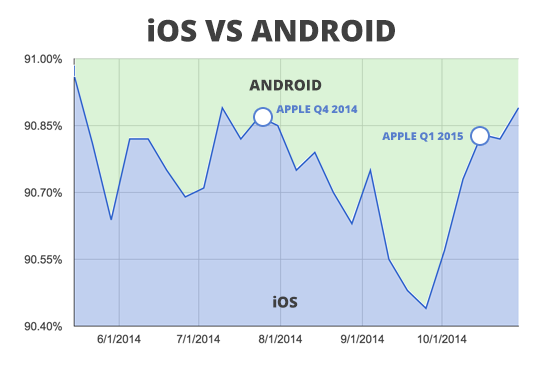 Given these numbers, the Q3 story looks uncertain for Apple. But let’s look at this from another angle: considering that the market is expecting Apple to lose market share, our numbers show that Apple is, in fact, still holding steady. So, given our logic, this should indicate that we’ll see an upside surprise during Apple’s earnings report. Will our numbers correlate with Apple? We’ll find out at 2 p.m. PDT. Each specialty experiences unique challenges in the area of charge capture. Cardiologists often interpret the results of ECG, echo, and stress tests performed at hospitals. The cardiologist sits down in front of 30, 50, or 100 test results and quickly analyzes them, spending no more than a few minutes on each. 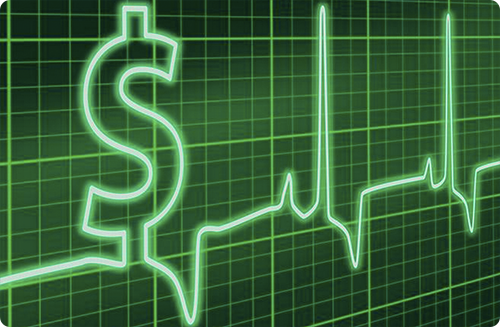 The reimbursement from insurance payers for each interpretation is quite small - for example, Medicare's 2013 fee schedule lists an average of $8 per ECG interpretation, of which Medicare pays 80 percent, or $6.40. The remaining $1.60 can theoretically be collected from the patient or from a secondary insurance carrier. To complicate things further, the majority of these patients aren't even associated with the cardiology service at the hospital. They aren't, strictly speaking, cardiology patients - and if their tests come back normal, they may never be! A hospitalist, ER physician, or another specialist ordered many of these tests to be performed to rule out cardiac issues. This puts the cardiologist in a pickle. Typically the physician's effort to capture all the necessary information for billing and get that information to the billing staff will significantly exceed $6.40 worth of time - especially when combined with the billing staff's time spent filling in any missing demographics, registering a new patient, checking the diagnosis and billing codes, and creating a claim. Several cardiology groups that I've spoken with have told me that due to these challenges, they just didn't bill at all for interpreting the lower-reimbursement tests. Simply put, it wasn't worth it. They would spend more time and money trying to get paid than the reimbursement was worth, and they had bigger fish to fry. This seems like sound business sense, but they were left with a lingering feeling that money was being left on the table and that they weren't being paid for all of their work. Depending on the capabilities of your charge capture software, it is possible to capture this reimbursement with no physician effort and minimal time required by billing staff to create each claim. Cardiology Consultants Medical Group in Los Angeles worked with pMD charge capture to create a proprietary feed directly from the cardiology system in which they were submitting their reports. This system could produce electronic data for each test result as the physician interpreted the test. It turned out that this report also contained the necessary information to create a billing claim. By working with CCMG and with the hospital, pMD automated the process from end to end. In an era of declining reimbursements and increasing time pressure on physicians and their staff, any new source of revenue is very welcome, as is this kind of deep automation that eliminates paperwork from a practice. The message for all providers, not just cardiologists, is clear: choose a software company for charge capture that supports your specialty-specific needs and that will work with you to find additional revenue. With declining reimbursements, every $6.40 counts! In my last post, I wrote about how the weather had finally warmed up enough for my wife and me to get out in the yard for some spring cleaning. Shortly after writing the post, I realized that we both had significant run-ins with poison ivy. If you've ever had it, you know how awful it is. You’ve likely made a vow to never go near three-leafed plants again. I waged a war, and I cleared the entire yard of the nuisance. 1. Charge Lag and Cash Flow: Mobile charge capture is a tool that has been around for over a decade, but has picked up steam over the last five years because it can help in all three of the above areas that still challenge most practices. Unfortunately, an inefficient charge capture system can be a toxic to your practice and its bottom line, while often happening steadily and inconspicuously. Through the use of an efficient and secure charge capture app, providers are able to submit their billing in real-time directly from the hospital. Often, this adds an additional week or more of revenue into that calendar year that was not previously available to the practice. You can read more on this in Adam Kenney's detailed blog post. When an intuitive application is utilized by the providers, billing offices recover charges that were previously lost in a paper system, and receive the providers' billing in seconds rather than weeks or months! 2. 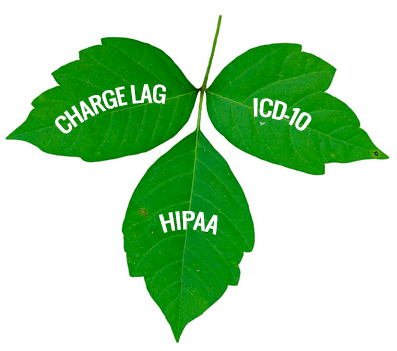 ICD-10 Rollout: Some charge capture solutions will help improve your transition to ICD-10 as well. There is a significant amount of anxiety about making this transition, but electronic charge capture solutions can make this transition easier for both providers and staff. Use a tool that will be ready well in advance of the 2015 deadline so you can be implementing and learning more about the transition as soon as possible. Also, choose a solution that the providers enjoy using where they can easily find codes without learning 50,000+ new descriptions. Your providers will be thrilled to get the 800 pound gorilla off their back and start steadily marching towards 2015 in a compliant manner. 3. Security and HIPAA Compliance: Charge capture also solves other problems for groups looking to enhance their security and HIPAA compliance. Consider choosing a charge capture solution that allows for secure communication and secure text messaging via physicians and staff – kill two birds with one stone, right? I’ve talked with several groups over the past couple weeks that are striving to get away from solutions like Google Docs or Dropbox as their patient communication platforms because neither solution is HIPAA compliant or used in real-time. With up to a $50,000 fine for a single HIPAA violation, it is time to get serious about protecting PHI while offering providers and staff the ability to securely text message with one another. From speaking with physicians, CEOs, CFOs, CIOs, and administrators, the three areas numbered above seem to be some of the common issues that are keeping them up at night. As you're looking at your practice to identify new areas of opportunity for growth and revenue, charge capture software can certainly assist in solving many of those chronic annoyances and toxins that affect your hospital and medical practice.